The Environmental Career Center (ECC) and nonprofit PASE Corps scheduled the Conservation Careers Seminar to help job seekers start their career search right for 2017. Then the new Administration came in and changed national priorities, loosened environmental protections, and proposed sharp budget cuts to programs important to environmental employment. That made us think maybe we should postpone it because of so much uncertainty. But it also seemed to be a good time for serious environmental, conservation, and sustainability professionals to double down and focus on both the challenges and opportunities of a new era in 2017. So we held an environmental conservation careers seminar. I had the pleasure of moderating the event that was held in the Chesapeake Bay Foundation’s awesome Brock Environmental Center in Virginia Beach. I kicked off the event by saying that there has not been this much uncertainty in the environmental careers sector since the Reagan Administration in 1981. That includes the major environmental career challenges resulting from the Great Recession since 2009. The jobs situation was so bad in 1981 that the Environmental Career Center advised recent college graduates that they might want to look at a Peace Corps gig in a remote country, consider using the biological degree for applying to medical jobs (most Federal field biology and natural resources jobs disappeared for over nine months), or go into grad school. It made perfect sense for me to warn Conservation Careers Seminar attendees that they might want to dig in, hide out, or change careers again in 2017 with the new anti-environment EPA Administrator in place, 31% EPA budget cuts proposed, an Energy Secretary that wants to move away from renewable energy, and a severe roll-back in environmental regulations. But our speakers wouldn’t have any of that. They talked about opportunities and overcoming challenges. Our first panel of speakers represented environmental conservation employers in the consulting, state government, municipalties, and nonprofit sectors. Cindy Shurling, Chief Project Manager for Ecology & Environment provided insight on the opportunities in working for a major environmental consulting firm. She discussed how consulting firms work -- they use experts in a variety of environmental disciplines to work on client projects, and often do it under very tight schedules. It takes a lot of focus and ability to work well both independently and as part of a team to be successful in consulting. Jennifer Huggins, Senior Park Ranger at First Landing State Park, emphasized that there are a lot of skills and personal characteristics one should have to ensure success in a state parks ranger position. She is a strong proponent for job seekers volunteering or working in related positions at state parks to get a good feel for what a park ranger does on a day-to-day basis. It’s great to have an outdoors, natural resources conservation job but job seekers should enjoy working with the public and have good people patience skills. While some Federal agencies are just beginning to take a hit in the budget and new hires, the Virginia Department of Conservation and Recreation has filled over 70 positions recently and that is encouraging. The Virginia DCR posts a lot of jobs this time of year just before the busy summer season. Daniel Baxter is the type of professional who loves challenges and is involved in finding innovative solutions. As the City of Newport News Business Recycling Coordinator, he is always looking for new ways to reimagine uses of the City's wastes before they become wastes. He often meets with entrepreneurs and business leaders who are exploring ways to reduce waste, improve the environment, and make a profit. Daniel's advice was, yes, look at the local job listing with municipalities, agencies, and environmental businesses. There are many excellent positions that open for short periods, so one must keep checking employer job boards often. But don't wait for a job come to you. Use your technical, business, and/or creative skills to find ways to solve problems for others and develop your own job opportunities. The most important thing is to network or get “Warm Handshakes”. Meet with people who are already in the field, they may be able to provide valuable leads and counseling on jobs that are available. Christy Everett is the Hampton Roads Director for the Chesapeake Bay Foundation (CBF). 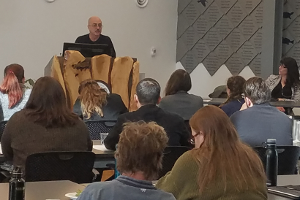 We had the privilege of conducting the Conservation Careers Seminar in their Brock Environmental Center which is one of the most sustainable green buildings in the world. Christy discussed the many rewards in working to restore the Chesapeake Bay ecosystem and presented the Chesapeake Bay Foundation’s work and accomplishments to help attendees see how a major nonprofit organization operates. She is also very passionate about helping job seekers find a career that they will love. Christy shared a list of job websites, LISTSERVES, and intern programs that can be helpful to job seekers. The Chesapeake Bay Foundation represents the nonprofit environmental sector of employment. 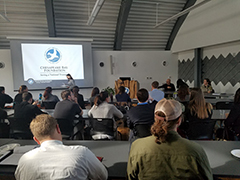 Shortly after the Conservation Careers Seminar, the President proposed eliminating funds for the Chesapeake Bay program, Great Lakes Initiative and other important environmental programs. That is not good news for many nonprofit organizations and regional environmental conservation programs. The good news is that public concern and donations are surging again in 2017 just as they did back in the early 1980s when there was a similar shift in environmental funding under the Reagan Administration. So it is important keep up the momentum for public pressure on Congress to pass budgets that preserve environmental funding for agencies and environmental conservation programs. The increase in donations to nonprofit organizations is encouraging and important. That will help environmental nonprofit organizations to grow and increase career opportunities when federal funds are less available. Overall, our Conservation Career Seminar panelists, representing the consulting, municipality, state government, and nonprofit sectors, were very encouraging about career opportunities for aspiring environmental professionals who are dedicated, flexible, and proactive in their career search in 2017. In Part 2 of the Conservation Careers Seminar summary, we’ll hear how our Federal agency speakers remain optimistic on environmental career opportunities for recent college graduates. These geographic program eliminations are $427 million lower than the 2017. Source: Executive Office of the President. America First: A Budget Blueprint to Make America Great Again. P. 42. Foundation for hosting the 2017 Conservation Careers Seminar.